You are here: Home / Providers / Yogesh Shrestha, M.D. Dr. Yogesh Shrestha is a board-certified lung doctor with specialized training in the areas of pulmonary, critical care and sleep medicine. He is also board-certified in Internal Medicine. 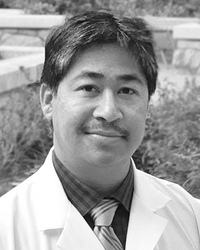 Dr. Shrestha specializes in state-of-the-art pulmonary procedures to include the new E.B.U.S. (Endobronchial Ultrasound) which allows better access to biopsy areas inside the lung and chest. Outside the practice of medicine, Yogesh Shrestha is a husband and father of three children. He enjoys hiking and the great outdoors of Colorado and in his home country of Nepal.